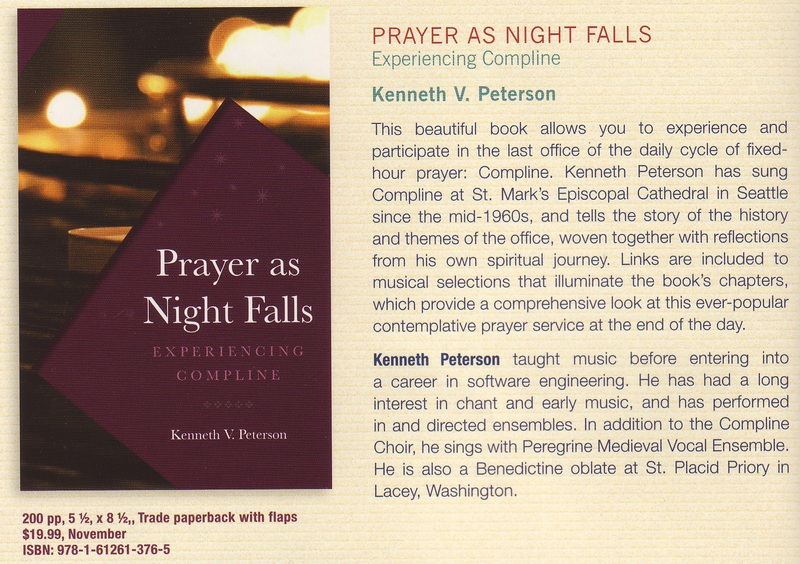 I’m happy to be finally writing again, after spending the last six months focusing on finishing my book, Prayer as Night Falls: Experiencing Compline, which will be published in November by Paraclete Press (the picture is from their Fall catalog). I sent the manuscript in the first week of April, and the editing took a couple more months. Recently, I went over the copyedited version, and sent that back yesterday, so I think I can come up for air now! Expect to hear more about the book in coming blogs, but there is so much more to write about. Next time I will tell you about the Compline Choir’s new CD (released at the end of May), I Will Meditate. Also check out a new source of Compline podcasts at king.org. Search for the Compline Service under the “On Demand” menu.